DETUCK known as a worldwide registered brand owned by Detuck Inc.is one of the most desired brand in North America, Europe and Asia. 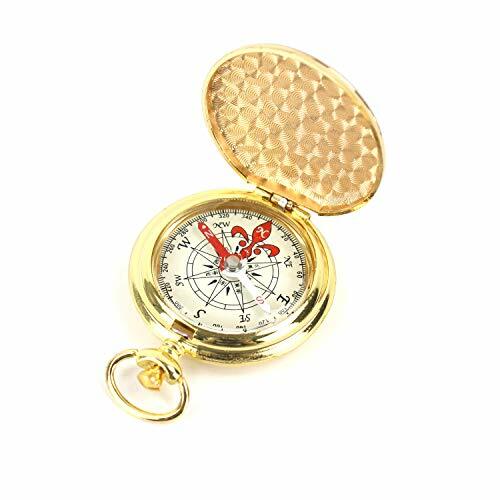 This golden vintage pocket compass scale is clear, pointer is accurate, portable to carry. It has metal body, senior gold-plated shell, mirror polishing, automatically opening the lid. Built-in damping oil, better stability, adapt to the environment, it can work in -20℃ to 50℃ harsh environment. Compass can glow in dark help you easy to read in bad weather after compass exposed to light. 5. Close it when not use, do not place it near ferromagnetic materials, in order to avoid loss of magnetism. Copyright 2018 by Detuck Inc.All rights reserved. 1,Pocket Compass. Pocket compass size 1.97in(D)×0.63in(H) portable compass to carry when you go out. 2,Antique Compass. Retro nostalgic style design, senior gold-plated metal shell, mirror polished surface. 3,Accurate Survival Compass. Compass scale is very clear, magnetic pointer is very accurate, it can be used in -20℃ to 50℃ harsh environment. 4,Great Compass Gift. Great compass gift for men,women,parents,kids,children,friends,family, Birthday, Valentine's Day, Father 'Day , Veterans Day, Christmas Day etc. 5,High Quality Camping Compass. DETUCK offer 1-Year Unconditional Warranty. Compass Backside Marked with DETUCK Trademark .Never as the Cheap Ones looks good but made by teenage labours, can be broken the next day. If you have any questions about this product by DETUCK, contact us by completing and submitting the form below. If you are looking for a specif part number, please include it with your message.